This is the second post in an occasional series on fundamental recipes which form the basis of a number of other dishes. 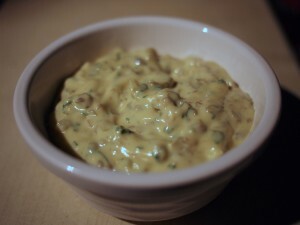 The first recipe I posted was for Béchamel sauce, and I’ve gone with sauce again today. I know that making mayonnaise at home is one of those things that scares people stiff: you’ll have heard stories about it splitting and curdling from almost everyone who has made it, and most seem to avoid making it at home, relying instead on a jar of Hellman’s. It’s true that splitting can happen to the best of us (mine actually split when I was preparing this post – my own fault for taking a short-cut with the food processor), but what most people don’t seem to realise is that a split mayonnaise is the easiest thing in the world to rescue. Mayonnaise is simply an emulsion of oil stabilised with egg yolks (raw, so the usual health warnings apply for those in at-risk groups – you know who you are), with a little lemon juice or wine vinegar. The sort of oil you use will affect the flavour; mayonnaise made with a strong-tasting olive oil, as with most European mayonnaises, will be fragrant and piquant. Sunflower oil is traditional in Russia, and gives a very different flavour. Many commercial mayonnaise manufacturers use flavourless vegetable oils and spike the finished product with sugar and other flavourings. Experiment, if you’re that way inclined – I rather enjoy a grapeseed oil mayonnaise, which has a delicate flavour and a lovely green tinge. You’ll find yourself using mayonnaise as the basis for a huge number of other classical sauces. There’s garlicky aïoli, which becomes rouille when saffron is added. Sauce rémoulade, which you’ll find in cuisines from Denmark to Louisiana, has flavourings which vary from country to country, but which almost always include anchovy, herbs and mustard. Thick American salad dressings – ranch, Thousand Island, blue cheese – all have their beginnings in mayonnaise. Argentinian salsa golf is based around mayonnaise (and ketchup, unfortunately). One of my favourite mayonnaise-based sauces is tartare sauce (sometimes called tartar sauce); you’ll find a recipe for it below. Mayonnaise is essential in a number of sandwiches – and there are plenty of recipes from devilled eggs to potato salad which employ hearty dollops of the stuff. I think Hellman’s mayonnaise is pretty good stuff, and if you don’t have the time or inclination to make your own, it’ll serve in all the recipes I mentioned above. But a home-made mayonnaise is a different thing altogether, and you may find that family members who think they don’t like mayonnaise at all will be brought round if you make your own. Home-made mayonnaise will keep in the fridge for a week. The recipe below will make about half a pint (enough for the tartare sauce and a potato salad, for which I’ll post the recipe on Friday), but if you need more or less, reckon on using another 200ml oil per every extra egg yolk. To whip up a bowl by hand, use a hand-whisk or electric whisk to blend the yolks, mustard, salt and vinegar in a large bowl. Whisking all the time, add the olive oil at first drip by drip, and as the mixture thickens, in a thin stream. You’ll end up with a glossy, wobbly bowlful of golden mayonnaise. Taste it – you may want to use more vinegar or salt. You can make mayonnaise in the food processor, whizzing the yolks, mustard, salt and vinegar together, then drizzling the oil in while the blade turns. I find it’s actually less reliable this way, perhaps because unless you’re making gallons of the stuff, the machine can have trouble liaising all the ingredients right at the start, so the mixture is more likely to curdle. You’ll be able to tell – it won’t thicken, and the oil and eggs will separate. If your mayonnaise does curdle, it’s easy to rescue: just remove the curdled mixture to a jug, give it a stir and start again in a clean bowl with one new yolk and a teaspoon of mustard. Continue as you would as if you were starting from scratch, but use the curdled mixture with an additional 100ml oil instead of fresh oil. This is as easy as anything. Dice the cornichons as small as you can, chop the shallots into tiny pieces and dice the shallot into pieces as small as the cornichon bits. Stir all the ingredients together and chill for an hour or so before serving to allow the flavours to come together. You’re probably used to tartare sauce with fish, but it’s also very good with breaded chicken and in sandwiches. Bought mayonnaise at shops stocking foreign foods in Beijing is absolutely disgusting. Kraft mayo – don’t go there, Real Time mayo – yuck, Kewpie Doll mayo – double yuck. Then I tried one of the outlets that stocks a large selection of Russian products – the mayo? horrible, horrible horrible! They are all so sweet, why? since when was sugar an ingredient in mayonnaise? 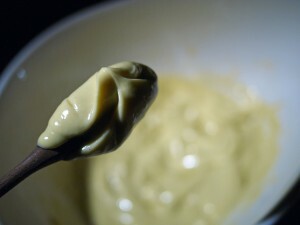 Anyhow, I used my usual homemade mayo recipe/technique – dribbled the EVOO slowly whilst whisking. Not great. So I went on line. And using a recipe which is almost identical to yours in terms of ingredients I have hit the jackpot. I used the hand-held blender (stick blender) which I have invested in here. I put everything into the blender jug at the same time – eggs, oil, mustard, lemon juice and izzy whizzy I had a whole container of the nearest thing to Helmans you could imagine. I did NOT use EVOO, well, just a teaspoon or two for flavour, in the interests of economy (and in case it didn’t work) I used soy bean oil – bland but perfect in this case. It was SO easy. I am a happy bunny and was able to make coleslaw this afternoon. BTW Xin nian kuaile! Wan Shi Ru Yi for the Year of the Rabbit! It’s not just sugar in Kewpie Doll – it’s sugar and apple juice. 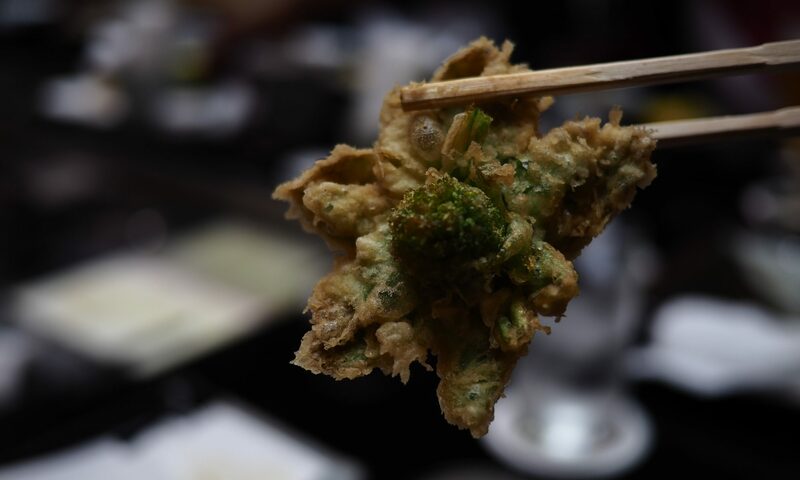 I did have a rather good Japanese dish where baby octopuses were slathered in Kewpie Doll and chilli sauce, then flash-grilled very hot; sounds revolting, but it actually turned out rather well. Soy bean oil sounds just the ticket for a mayo that’s not over-flavoured (all olive oil can be quite strong, as I mentioned above). I’m not sure if I’ve seen it for sale over here – I shall keep an eye out! Gong Xi Fa Kai to you too! I absolutely love making home made mayonnaises. It’s such a versatile binder that you can flavor accordingly. My favorite application thus far is subbing a quarter of the olive oil with toasted sesame oil and bit of chili oil. I use this for me Asian chicken salad, and what a difference it makes! That sounds *beyond* good, Mark. It’s on the list of things to try! My Mum taught me to make basics like Bechamel and Mayonnaise and they are honestly the best things she ever taught me (along with how to bake and the basics of slow-cooking cheap meat in some form of liquid, preferably alcoholic). There is nothing like homemade mayo. It’s truly glorious stuff and it raises simple ingredients to a fine meal.